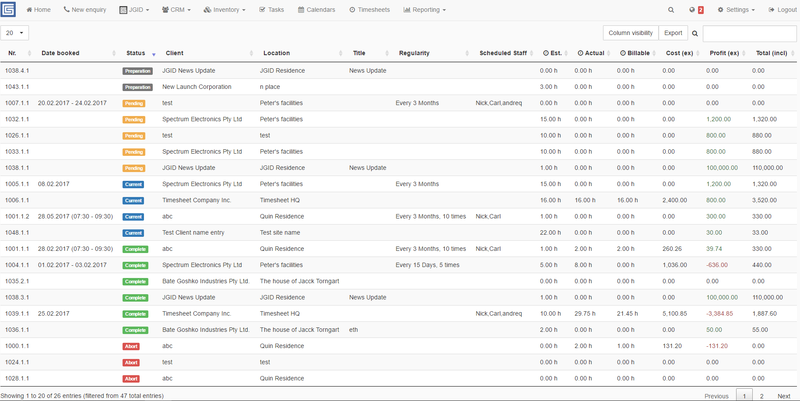 The current status of the job you are reviewing or editing, can be traced on the right side of the JGID panel, at the top of the Management Column. As you progress through the different stages of the Job implementation, so change the indication labels for both reference and statistics. The Job has five progress stages with four respective colour coded labels, automatically updated during the transfer from one stage to another. The five stages chronologically are – Preparation (dark gray colour highlighted), Pending (orange colour highlighted), Current (blue colour highlighted), Complete (green colour highlighted); the fifth stage is called Abort (red colour highlighted) and can be triggered only after the Job status is Current! Once you progress a job to a stage you can’t take it back to the previous one. Still, provided the job has not been lebeled completed, you can edit the items and services listed in the overview panel and make all kind of changes and adjustments.